Woody Allen has been making a movie every year for a while now, and while consistency has never been his strong suit, that's always something to look forward to. Sometimes he makes great ones (Midnight in Paris, Match Point), sometimes he makes popular ones (Scoop, Vicky Cristina Barcelona), sometimes just okay ones (From Paris with Love), and sometimes you get the rotten egg (You Will Meet a Tall Dark Stranger). Of course, every now and then he makes the one only I like (Whatever Works), but I'm happy to say that Blue Jasmine is one of the really good ones. It might even be one of the great ones, in large part because of Cate Blanchett, playing a woman in the middle of a mental breakdown with serious denial issues. Jasmine Francis (Blanchett) was married to Hal (Alec Baldwin) and lived the life of a socialite in New York. Hal was an investment manager, but he was also not-so-secretly running a serious Ponzi scheme, and when he got caught, couldn't take the heat and killed himself in prison. With no support and with all of her assets seized, Jasmine reluctantly moves to San Francisco to live with her sister, Ginger (Sally Hawkins). Jasmine and Ginger aren't actually related (both were adopted), and Jasmine only barely spoke to her much poorer, "lower class" sister when Ginger was married to Augie (Andrew Dice Clay), but she's out of options. By the same token, Ginger's always been a little jealous of Jasmine, the "pretty one," who was always more successful, so it's a tenuous situation. It also means her new boyfriend, the sweet but tempermental Chili (Bobby Cannavale) can't move in as planned. Oh, by the way, Jasmine isn't her name - it's Jeanette, but she changed it because she liked the color. Like much of her life, Jasmine deludes herself into believing it's actually her name and that her mother gave it to her, but she also has some serious mental stability issues. Throughout the film, as Allen jumps backwards and forwards in time to fill in the gaps of how their lives collapsed, he'll often cut back to Jasmine repeating dialogue from the flashback to herself, out loud. People nearby often don't know how to react, and the woman sitting next to Jasmine on the plane to San Francisco gets more than anybody ever wanted to hear just for asking "were you talking to me?" Augie is still in the picture, and the reason his marriage with Ginger broke up is the same reason he doesn't trust Jasmine moving in with her: Hal tricked Augie into giving him lottery winnings to invest, largely upon Jasmine's insistence, and they lost everything. Ginger might have also seen Hal with another woman, but she can't be sure and won't tell her, even when Augie says he would. Ginger seems happier with Chili, but Jasmine is more disgusted with him than she was with Augie, and works to split them up. Uncertain of what she's supposed to do (other than drink to keep the depression, anxiety, and trauma at bay), Jasmine takes a job as a receptionist for dentist Dr. Flicker (Michael Stuhlbarg) so she can pay to take computer classes in order to be able to become an interior decorator on an online course. Meanwhile, she insists she was oblivious to Hal's illegalities, even as the flashbacks continue to fill in the pieces. Things begin to look up when Jasmine drags Ginger to a party and they each meet new men: Ginger meets Al (Louis C.K. ), a nice guy who sets up stereo equipment, and Jasmine meets Dwight (Peter Sarsgaard), a diplomat with expensive tastes and political ambitions. But, as seems to be the case with the sisters, not everybody is being entirely honest at the beginning of these budding relationships, although it might surprise you who isn't and why. Everybody seems nice (well, except Jasmine) and everybody means well, but it's not always so easy to just be honest with themselves or each other. If I'm making Blue Jasmine out to sound terribly serious, I don't mean to. It's actually a very funny movie, if tinged with a dark undertone. Much of the humor comes from the oblivious, deluded Jasmine, who struggles to maintain her superiority over Ginger and everyone else early in the film, and the flashbacks which make it abundantly clear how open Hal is about the fact that he's ripping people off (there are a number of scenes where he's scheming with his lawyers to keep things appearing to be above board). Blanchett and Hawkins are an excellent study in contrast: the former a complex, nuanced performance in maintaining a facade while falling to pieces mentally, and the latter a woman disrupted, torn between the life she enjoys and wanting to please someone she looks up to. Added to that is a surprisingly sweet turn from Andrew Dice Clay, as the sincere but beleaguered Augie, who wants to do right by Ginger but can't stand what Jasmine and Hal did. Louis C.K. is only briefly in the movie, but plays a less sardonic verison of his character from Louie. Bobby Cannavale's Chili is, even during violent outbursts, a man madly in love with Ginger that doesn't understand why Jasmine can't just let them be happy. I was also quite taken with Sarsgaard, who plays a mostly materialistic character until one scene late in the film where his reaction to Blanchett will remind Allen fans of the best kinds of Woody blow ups. Alec Baldwin is stuck with the sleazy part, and he does it well, but his purpose in the flashbacks is largely to get us to the last revelation, the one that really put Jasmine where she is mentally. If Midnight in Paris was too whimsical for you, I think Blue Jasmine might be the best mix of sweet and sour Woody Allen we've had in a while. You'll laugh, and marvel at Blanchett's performance, which is at times mesmerizing, and by the end be impressed at the sleight of hand. It's been a while since I saw an Allen film that surprised me at the very end, and credit where it's due for structuring the film in such a way that even I wasn't quite sure where it was headed - other than "not well." 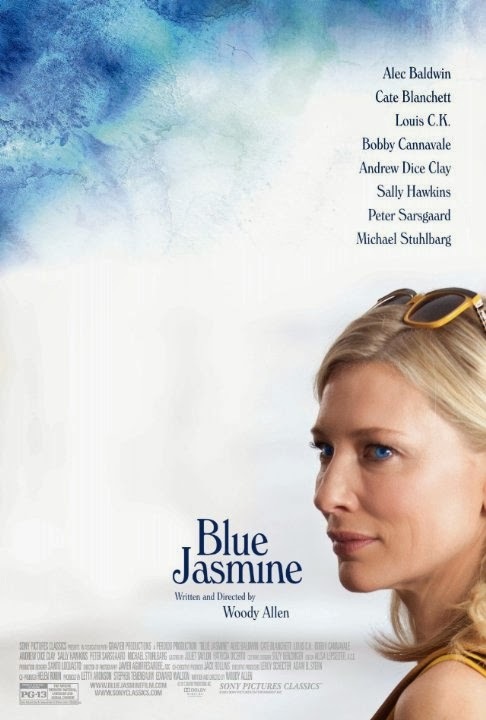 Blue Jasmine comes highly recommended, for casual viewers but also for dedicated Woody Allen fans. You never know what's coming next, but at least there's another candidate to join the great ones in the meantime.